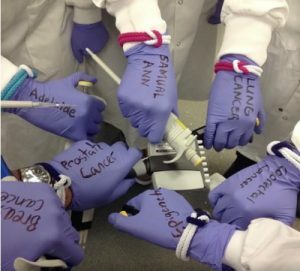 Cancer Research UK (CRUK) introduced the unity bands as a symbol of our united front against cancer and a pledge to help beat cancer sooner. The 4th of February is World Cancer Day. This is a day to remember and celebrate. Sadly cancer affects us all whether it’s personally or through our friends and family or work colleagues. In fact it’s estimated that 1 in 2 of us will be affected by cancer at some point in our lifetime. But in the face of this depressing statistic there is cause to celebrate. We can celebrate the people we know who have beaten cancer, celebrate the lives of those we have lost and celebrate the ground-breaking research being done by thousands of people across the UK and the world to help beat cancer sooner. 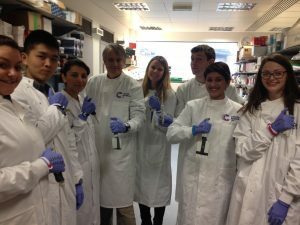 I started my career in cancer research in the final year of my undergraduate. As I was starting my final year project in breast cancer research, someone very close to me was diagnosed with breast cancer. Thankfully she fought tooth and nail and came out a survivor but this moment really drove home the importance of the work that cancer researchers, clinicians and volunteers do to find new ways to prevent, diagnose and treat cancer. The theme of World Cancer Day 2016-2018 is “We can. I can.” It may not seem likely but everyone as an individual can have an impact on cancer as a disease. This is why it’s a great opportunity on World Cancer Day to raise awareness of the different types of cancers and how we as a collective can beat each and every one. Prevention is one of the key ways we can reduce cancer incidence. There are many preventative steps we can all take. Health and lifestyle factors (also known as risk factors) influence the chances of developing cancer. We can reduce this influence by changing small habits, for example reducing our alcohol intake, stopping smoking and adopting more balanced, healthier and active lifestyles. We also want to keep an eye on our bodies, get to know what’s normal for us so we can spot when something isn’t normal. These simple individual changes can add up to a global shift in cancer incidence and mortality. You can get involved with World Cancer Day like many cancer charities that have come together to raise awareness and funds. For example Cancer Research UK (CRUK) introduced the unity bands as a symbol of our united front against cancer and a pledge to help beat cancer sooner. The funds raised from these unity bands help towards vital cancer research. Research like my own, funded by CRUK, investigating the Type II Diabetes drug metformin as a possible preventative agent for breast cancer. 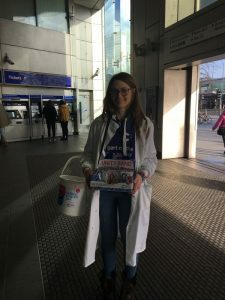 Last year I helped sell some unity bands in West London. I was there as the “resident scientist” to do a taste test demo with the public. This simple test shows how when we look at cancer we can detect these small differences, which highlight key areas researchers could use to target cancer and tailor treatment for the individual. So on the 4th of February go out and spread the word. It can be as eye-catching as wearing a unity band or as simple as having a chat with a friend about common cancer symptoms. Whatever you do you are contributing to the fight against cancer. In the words of the World Cancer Day – We can. I can! World Cancer Day Union for International Cancer Control (UICC). (2018). World Cancer Day. Available: http://www.worldcancerday.org/about/2016-2018-world-cancer-day-campaign. Last accessed 1st February 2018. Cancer Research UK. (2018). World Cancer Day 2018. Available: http://www.cancerresearchuk.org/support-us/donate/world-cancer-day. Last accessed 1st February 2018.